Eric Kohn is marketing manager at the Illinois Policy Institute. Eric Kohn is marketing manager at the Illinois Policy Institute. In that role, he works to facilitate conversation, increase engagement, and drive advocacy within the Institute’s digital community. Prior to joining the Institute, Eric was founder and CEO of Curious Task Strategies, a public affairs consulting firm. He is the leader of the Chicago chapter of America’s Future Foundation, an organization dedicated to developing the next generation of classical liberal leaders in Chicago. Eric is also a board member of the Institute to Reduce Spending. 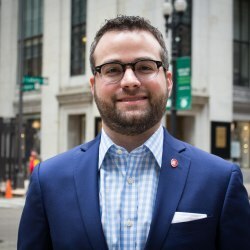 He previously hosted The Eric Kohn Program on 1530-AM WJJG, and has guest-hosted the nationally syndicated The Guy Benson Show, Illinois Watchdog Radio on Cities 92.9FM in Bloomington-Normal, and Chicago’s Morning Answer on 560-AM WIND. He has appeared as a commentator on Extension 720 with Milt Rosenberg, The Michael Koolidge Show, WTTW’s Chicago Tonight, and numerous news broadcasts in the Chicagoland area. Eric’s writings have appeared in the Chicago Sun-Times, the Belleville News-Democrat, the Madison/St. Clair Record, and other publications. Eric grew up in Belleville, Ill., and is a graduate of Millikin University in Decatur, Ill.